Above: YogaZo at Rio Bravo Brewing Company. Photographs by Douglas Merriam. It turns out that throwing back a cold one in between downward dog and tree pose is a trend I never knew I wanted. But I do. I mean, is there a better way to pay tribute to thyself? While die-hard yogis may not feel the same, many of us mortals need a bit more incentive, as in a beer, to take our self-care practices to the next level. 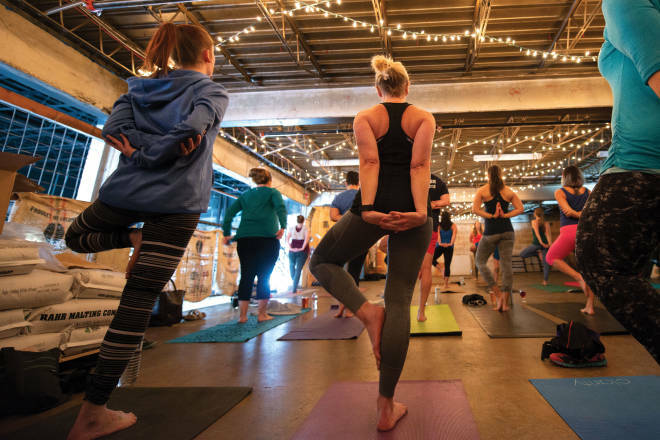 Thankfully, several breweries have us covered with inexpensive and accessible yoga classes. Every Sunday, Toltec Brewery, in Albuquerque, hosts Beer Belly Yoga with Everliving Wellness. All levels are invited for a one-hour session that begins at 10 a.m. Bring $5 for a donation to the instructor and hang around for $1 off your first beer after class. Join YogaZo at Rio Bravo Brewing Company on December 16 and Bow & Arrow every Tuesday at 6:30 p.m. for an hour-long yoga class open to all experience levels. They also flex at other breweries, including Marble on Saturdays, from 11 a.m. to noon at Santa Fe Brewing (Albuquerque) on Mondays. Sessions cost $5, with the proceeds helping to carry YogaZo’s mobile studio all over Albuquerque.